Western blot analysis of extracts from various cell lines using COL1A1 (E8I9Z) XP® Rabbit mAb (upper) and β-Actin (D6A8) Rabbit mAb #8457 (lower). Immunoprecipitation of COL1A1 protein from U-118 MG cell extracts. Lane 1 is 10% input, lane 2 is Rabbit (DA1E) mAb IgG XP® Isotype Control #3900, and lane 3 is COL1A1 (E8I9Z) XP® Rabbit mAb. Western blot analysis was performed using COL1A1 (E8I9Z) XP® Rabbit mAb. 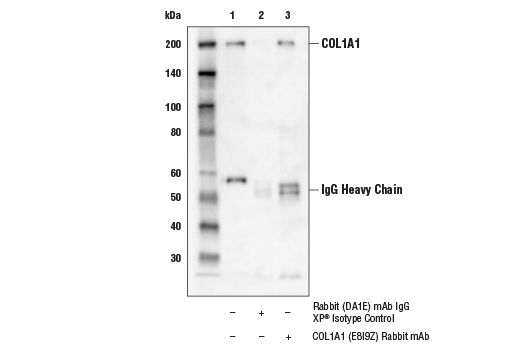 Anti-rabbit IgG, HRP-linked Antibody #7074 was used as secondary antibody. Immunohistochemical analysis of paraffin-embedded human colon carcinoma using COL1A1 (E8I9Z) XP® Rabbit mAb performed on the Leica® BOND™ Rx. Immunohistochemical analysis of paraffin-embedded human non-Hodgkin's lymphoma using COL1A1 (E8I9Z) XP® Rabbit mAb performed on the Leica® BOND™ Rx. Immunohistochemical analysis of paraffin-embedded human serous papillary carcinoma of the ovary using COL1A1 (E8I9Z) XP® Rabbit mAb performed on the Leica® BOND™ Rx. Immunohistochemical analysis of paraffin-embedded human prostate carcinoma using COL1A1 (E8I9Z) XP® Rabbit mAb performed on the Leica® BOND™ Rx. Immunohistochemical analysis of paraffin-embedded human esophageal adenocarcinoma using COL1A1 (E8I9Z) XP® Rabbit mAb. Immunohistochemical analysis of paraffin-embedded human ductal breast carcinoma using COL1A1 (E8I9Z) XP® Rabbit mAb (left) compared to concentration matched Rabbit (DA1E) mAb IgG XP® Isotype Control #3900 (right). Immunohistochemical analysis of paraffin-embedded human renal cell carcinoma using COL1A1 (E8I9Z) XP® Rabbit mAb. Immunohistochemical analysis of paraffin-embedded U-118 MG cell pellet (left, positive) or HT-29 cell pellet (right, negative) using COL1A1 (E8I9Z) XP® Rabbit mAb. Immunohistochemical analysis of paraffin-embedded human prostate carcinoma using COL1A1 (E8I9Z) XP® Rabbit mAb. 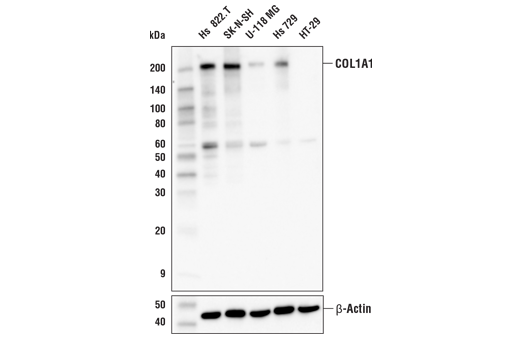 COL1A1 (E8I9Z) XP® Rabbit mAb recognizes endogenous levels of total COL1A1 protein. Monoclonal antibody is produced by immunizing animals with a synthetic peptide corresponding to residues surrounding Phe1197 of human COL1A1 protein. Type 1 collagen is the most abundant collagen in many human tissues, including bone, skin, and tendons. It is a trimeric complex comprised of two molecules of COL1A1 (alpha-1 type 1 collagen) and one molecule of COL1A2 (alpha-2 type 1 collagen) (1-3). The expression levels of COL1A1 are regulated by multiple mechanisms, including mRNA stability, translation, and posttranslational modification (3-5). Overexpression of COL1A1 has been positively associated with tissue fibrosis disorders, including systemic sclerosis (6), while loss-of-function mutations in the COL1A1 gene are a major causative factor for osteogenesis imperfecta (brittle bone disease) (7). Notably, COL1A1 expression levels have also been associated with tumor development in gastric, lung, thyroid, and breast cancers. Research studies suggest that upregulation of COL1A1 can generate a modified extracellular matrix environment that promotes cancer cell survival, proliferation, metastasis, and invasion (8-11). Prockop, D.J. and Kivirikko, K.I. (1995) Annu Rev Biochem 64, 403-34. Chang, S.W. et al. (2012) Biophys J 102, 640-8. Zhang, Y. and Stefanovic, B. (2016) Int J Mol Sci 17, 419. Parsons, C.J. et al. (2011) J Biol Chem 286, 8609-19. Cai, L. et al. (2010) J Mol Biol 395, 309-26. Jimenez, S.A. and Saitta, B. (1999) Springer Semin Immunopathol 21, 397-414. Forlino, A. et al. (2011) Nat Rev Endocrinol 7, 540-57. Li, J. et al. (2016) World J Surg Oncol 14, 297. Oleksiewicz, U. et al. (2017) J Cancer Res Clin Oncol. Barcus, C.E. et al. (2017) Breast Cancer Res 19, 9. Jolly, L.A. et al. (2016) Cancer Res 76, 1804-13.